Marc Ribot says it best when he sings 'why burn like a crazy Roman candle when you've got a hand grenade'. 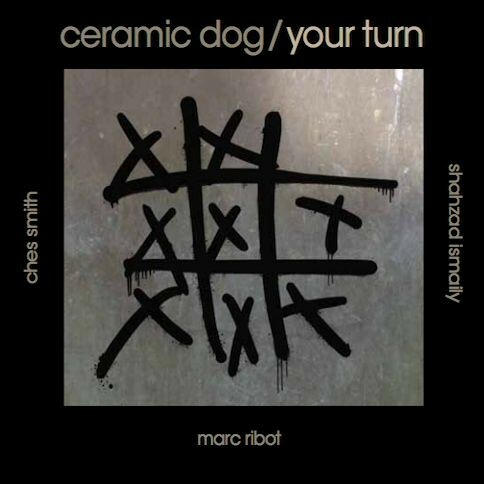 Musical shrapnel, sharp lyrics and well conceived mayhem explode from the second recording by Ribot's Ceramic Dog. 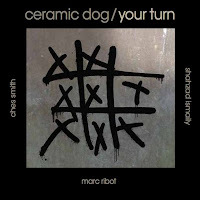 Your Turn is seething, powerful, delightful, and one heck of a rock album. The collection of songs run the gamut from stomping punk ('The Professionals') to campy fun ('Back in Love Again') to avant rock ('Your Turn'), all lovingly draped in a dark and brittle sound that embraces the decay that goes along with beauty (or perhaps finds the beauty that exists in decay?). Regardless, with Shahzad Ismaily on bass and electronics and Ches Smith on drums, the group can be both hard hitting and nuanced. One striking aspect of the recording is the perfect setting Ribot created for his singing and lyrical prowess. The intro to "Lies My Body Told Me" sounds to me a little bit like if Morphine was fronted by Gordon Gano, before exploding with the vibrant and dark intensity that fills the album. I won't delve into the ironic and witty lyrical content, but I am excited to let you discover the wit and pointed criticism to be found in 'Masters of the Internet' and sheer joy of 'The Kid is Back'. On Your Turn, Ribot seems to have brought together many sides of his musical career. From the more song based structures found in his support work with Tom Waits and many others, to his restless experimental work on his own recordings with say the Rootless Cosmopolitans, to his dark instrumental rumination that exist throughout solo efforts like Saints and even Silent Movies. Elements that have appeared throughout are assembled into a cohesive whole, and when aggressive avant-punk-jazz juxtaposes with Tin Pan Alley chord progressions, it makes perfect sense. I listened to the album three times in a row and it completely knocks me off. I agree with every word, Paul. Already one of the best albums this year. That tune you linked to seriously cranks. I can hear the Gordon Gano, but to me he sounds more like Iggy on the Stooges tune "1969". Agree with the Iggy comparison. Told my brother it was the best Iggy song in 30 years.